As US Today just reported “A surge in early voting totals in key states across the nation suggests that 2018 could be the year that young people finally show up for a midterm election.” Some estimates put the youth turnout rates up by 125 percent compared to 2014. Whatever happens in the mid-term elections today, there is another way the youth will be heard, especially on climate. Last Friday, the Supreme Court rejected the Trump administration’s request to prevent a lawsuit, known, Juliana v Gov., brought by 21 youths who are seeking to hold Trump and his administration to account for failing to act on climate change. It is being described by some as the Trial of the Century. The lawsuit had been scheduled for trial on October 29th in Eugene, Oregon, but the Trump Administration managed to secure a last minute “stay” order from the Supreme Court to delay the trial. To coincide with the proposed trial, according to 350.org, there were over 90 demonstrations and marches across the US–and several globally in Copenhagen and Uganda. The demonstrations used the #LetTheYouthbeHeard. But last Friday, the Supreme Court rejected the Trump administration’s request. And so the legal action moves forward. It is an historic case. The youths argue that by neglecting to properly address climate change, the government is depriving them of rights to life, liberty and property while also failing to protect essential resources. The case was originally brought under the Obama Administration. 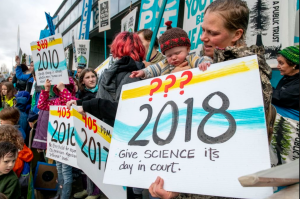 Their lawyers contend: “These young Plaintiffs, mere children and youth, are already suffering irreparable harm which worsens as each day passes with more carbon dioxide accumulating in the atmosphere and oceans”. Previously one of the plaintiffs Kelsey Juliana, from Eugene, Oregon had outlined: “This will be the trial of the century that will determine if we have a right to a liveable future, or if corporate power will continue to deny our rights for the sake of their own wealth”. Meanwhile, President Trump has given an interview with “Axios on HBO” regarding climate change where he disavowed his own scientists and government on the issue. Trump’s climate ignorance is another reason why we must #LettheYouthbeHeard.